The Beano/Dandy isn’t British anymore. They’ve changed it. He isn’t allowed to hit Walter, who has a girlfriend now. He’s all “rad, dudes!”, and he doesn’t look the same, and he does nice things. They’ve changed it, They’ve changed it, They’ve changed it!!! Talk to teh hand, cos ze face, it ain’t lissenin. 1. Social attitudes towards homosexuality in the 1950s when Walter was created was one of “the other”, or “the enemy”, disgusting and open for ridicule. A bit too cutting edge to make Walter gay, but they certainly went for camp and feminine. 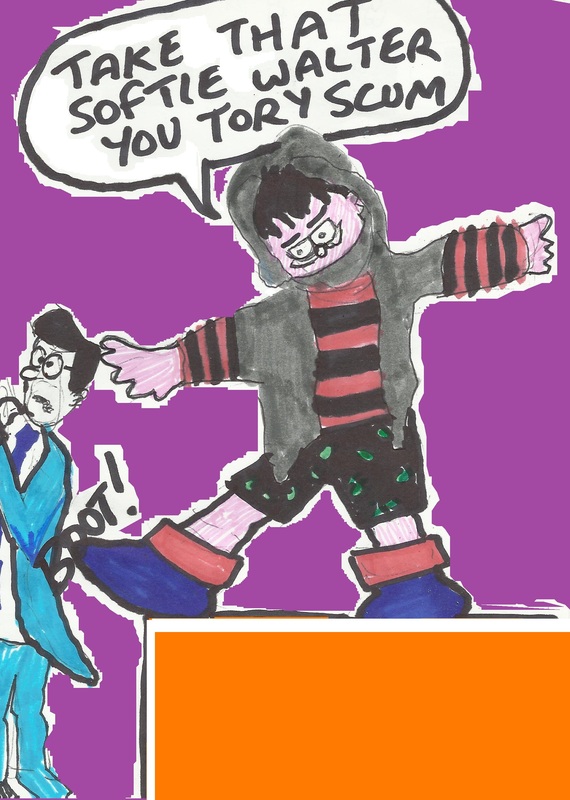 In the 1980s and 90s, Walter was shown engaged in a fair bit of transvestitism and shortly after they began to roll back from “the LGBT baddie in a kid’s comic”. Until this time, there is very little change in the set-up: which leads us onto my next point. 2. Why the Darria would kids of today want to read a comedy about a cool punk and his society holding 1950s values? 3. Journalistic/Reviewer integrity: If I’d a quid for every journalist who wrote, “I’ve cancelled my Beano/Dandy subscription because it’s not what it was”, I’d be doing okay. Double that where they hadn’t read those comics since they themselves were kids, and I’d be a rich man. Liars. They contribute to falling sales and less job security for brilliant cartoonists. (eg. Jamie Smart) Come on, where’s your evidence that you actually bought those comics recently or had them bought for you as gifts? Let’s get academic here. The entire debate glosses over ‘reader types’ anyway. 4. Dennis the Menace US and UK are two unlinked entities, both created in 1951, with the UK version published five days ahead. Have never read the comic or seen the film and can’t comment on the crappiness of either. I did see Beavis and Butthead do their rendition of the Brady Bunch theme tune and that was quite good.